GlueBack is a capillary blocker, and prevent blistering of paint and will bind brittle or sandy substrate. 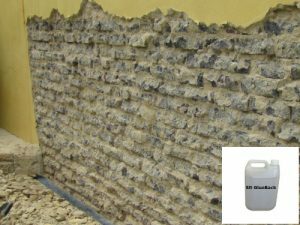 This product has been designed to stop moisture migrating to the surface of plaster and concrete. 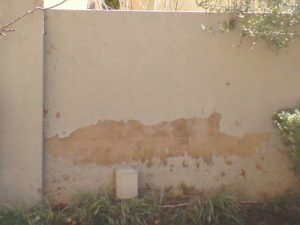 Plaster bricks and non-vibrated concrete is porous and water will be absorbed through the capillaries, this leads to leaking balconies, roofs and damp walls. Salt inside the bricks and plaster attach itself to moisture that penetrates brick walls and plaster, these salts migrate to the surface of the wall or slab and is visible as efflorescence on the surface. These salts cause deterioration of the plaster and concrete and result in severe paint blisters, etc. GlueBack can be brush applied or sprayed onto the affected area, droplets of GlueBack will penetrate into the capillaries and ill stop moisture and salts migrating to the surface and thus stop the deterioration of the plaster and concrete and result in severe paint blisters. Remove blistering paint and deteriorated plaster, smoothen with new plaster, GlueBack is brush or spray applied. Paint 2 days later.